MyDraw is an advanced diagramming software and vector graphics drawing tool. MyDraw includes powerful features to help you with your flowcharts, org charts, mind maps, network diagrams, floor plans, general business diagrams and drawings. It includes libraries with hundreds of diagram shapes and symbols, templates, powerful drawing tools, automatic diagram layouts, advanced printing and exporting capabilities, and many more. MyDraw is a great alternative to Microsoft Office Visio that is available for Windows and Mac users. Use MyDraw to create flowcharts, organizational charts, mind maps, network diagrams, floor plans, UML diagrams and general business diagrams. MyDraw is an ideal Microsoft Visio alternative for Windows and macOS (Mac OS X). You can easily replace Visio with MyDraw, no matter if you are using a Windows PC, or a Mac machine. When it comes to visual communication and seamless collaboration between many people, or large businesses, the MyDraw diagramming software is a perfect solution. Sharing your flowcharts, org charts, mind maps, network diagrams, floor plans and general business diagrams has never been easier for Windows and macOS users. The advanced Visio Drawing Import and Export (VSD, VSDX) of MyDraw will allow you to easily convert your Visio diagrams and work with them in Apple macOS and Windows Operating Systems. MyDraw also provides support for Visio-like “smart” shapes – dynamic diagram shapes based on formulas. Hundreds of free diagram examples and templates. 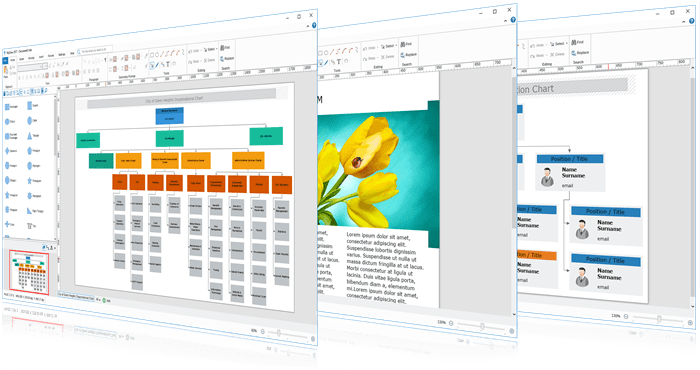 MyDraw includes many ready-to-use templates for flowcharts, organizational charts, flyers, certificates & business cards, and various diagram types. You can easily get started by editing existing diagram templates and making your own.